The biggest bank in Russia, which has been under U.S. sanctions since 2014, just launched a state-of-the-art coding school in Moscow that aims to train thousands of world-class software engineers in the arts of cybersecurity, gaming, and the latest AI technology for years to come. School 21, which operates under the umbrella of Ecole 42, a global pioneer in IT education backed by French billionaire Xavier Niel, is wholly owned by Sberbank. It is free, open to aspiring coders from 18 to 30 years old, and has 21 levels of proficiency. The school is highly competitive–its inaugural program has a class of 500 students out of more than 85,000 applicants, and the plan is to scale up to 2,500 a year in the long term, according to Business FM radio station. Sberbank told Fast Company that it plans to run two more application cycles next year, one in the winter and one in the spring, and that it might open a second office in St. Petersburg. The school’s launch is raising concerns about Russia training thousands of highly skilled cyber specialists at a time when the United States is expanding its sanctions against Russian entities, including Sberbank-backed properties, and amid heightened tensions in Europe last week over a naval skirmish between Russian and Ukraine in the Kerch Strait. It also comes against the backdrop of the Russian government’s disinformation efforts in elections around the globe, which the Kremlin has vehemently denied. In addition, Sberbank has been in the spotlight due to the history of high-level connections between the bank’s leadership, the Russian government and Donald Trump’s associates before he became U.S. president. It was bank chairman Herman Gref who set up Trump’s meeting with Russian businessmen during the Miss Universe pageant in 2013 in Moscow, an event which Sberbank co-sponsored, while Trump was exploring building a Trump Tower in Moscow. Trump’s hotel plans are making headlines again this week due to the plea deal that Trump’s former lawyer Michael Cohen negotiated with the Mueller probe–Cohen admitted that he lied when he previously claimed that the deal fell through in January 2016, now conceding that talks for a Trump Tower in Moscow continued up until June 2016. 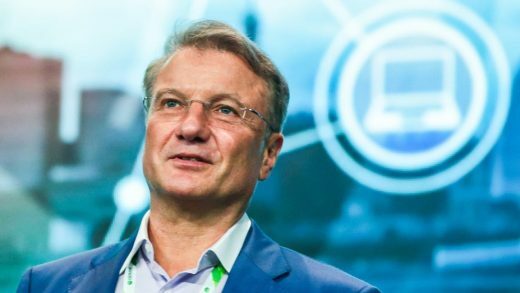 Sberbank’s drive to build up a domestic talent pool will help ease the Russian market’s dependency on Western software like Microsoft products, which face an uncertain future amid strained relations between Microsoft and the Russian government and reports of Microsoft exiting the Russian market. In recent years, there has been increasing demand for Russian software and local operating systems like ALT Linux. At the opening ceremony last week, Russia’s education ministry and Sberbank hailed the school’s launch as a “new era in education,” emphasizing the high caliber of software engineers they are looking to groom. The so-called “pools” are weeks-long grueling tests that the applicants must pass as a part of the entrance exam. Sberbank signed an agreement with École 42 back in May. The teacherless philosophy and nerdy terminology also come from École 42, whose name is a reference to a detail in cult classic, Hitchhiker’s Guide to the Galaxy. State bank the best way to groom talent? With over 50% of the new students coming from Russia’s far-flung regions, this program hopes to democratize such IT instruction, which has traditionally been the domain of the country’s prestigious universities that are not accessible to everyone. But is having a state bank the best way to groom talent? Despite the bank’s close ties to the Kremlin—the government has a majority stake in the bank—Sberbank insists that the school will not be used by the government to groom students for intelligence work or political purposes. The bank’s press service said neither Sberbank nor the government plan to make recommendations to graduates. “The graduates of the school do not have any obligations for employment after training and decide for themselves in what areas and directions to apply their knowledge,” Sberbank told Fast Company in a statement. While Sberbank has been under U.S. sanctions for years, there are no signs of tensions going away. While Europe is still in the process of updating its Russia policy, last week’s naval skirmish with the Ukraine sparked a new wave of tensions. The German government said on Tuesday that it favors a Dutch proposal that would introduce an EU-wide blacklist against countries and regimes committing human rights violations. In any scenario, the new school would help Russia diversify its talent pool, build for the future and ease its dependency on Western technology, if the sanctions were to endure and expand. “Russia is accelerating its efforts to build as much local software at least as possible to get out of dependency from foreign products like Microsoft and SAP, and in some way even help those foreign products creators from possible political threats as well,” says Vrublevsky. Russia already has a track record of tapping its hacker talent pool and deploying it for political means. What will happen when this pool is actively cultivated by a state-owned entity, is bigger and more skilled?